This soup is the bomb diggity. You heard me: BOMB DIGGITY. This carrot soup is as bomb diggity as they come. It’s also 5-ingredient easy, Instant Pot ready (<- affiliate link), vegan, supes clean, cozy, and easily freezable and share-able, all of which makes it an awesome addition to our Feeding a Broken Heart series. 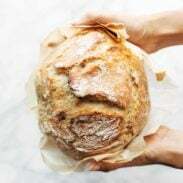 The other day on Instagram, someone told me that she wanted to bring a recipe to her friend who is going through a hard time, but her friend needs a dairy free gluten free everything free recipe. I am happy to report that this carrot soup is quite easily dairy free, gluten free, and more. It is very friendly for a lot of people who might otherwise have a hard time with all the carbs and cheese that we are packing into this series, and guess what? CARROT SOUP DON’T NEED NO CHEEZ. It’s bomb diggity delicious. True story of how I made this soup has nothing to do with anyone bringing me anything or me bringing anything to anyone. It’s an actual Tale of Laziness, which is how most of my favorite recipes get born. A walk to the fridge for lunch turned into an unsuccessful hunt for leftovers, so I went into Fridge Scrounging Mode and found one basic thing: carrots! um, yay? A quick scan around the pantry and I was able to locate an onion, some garlic, a can of coconut milk and a little curry paste, and suddenly my food brain came alive and everything turned straight up orange. 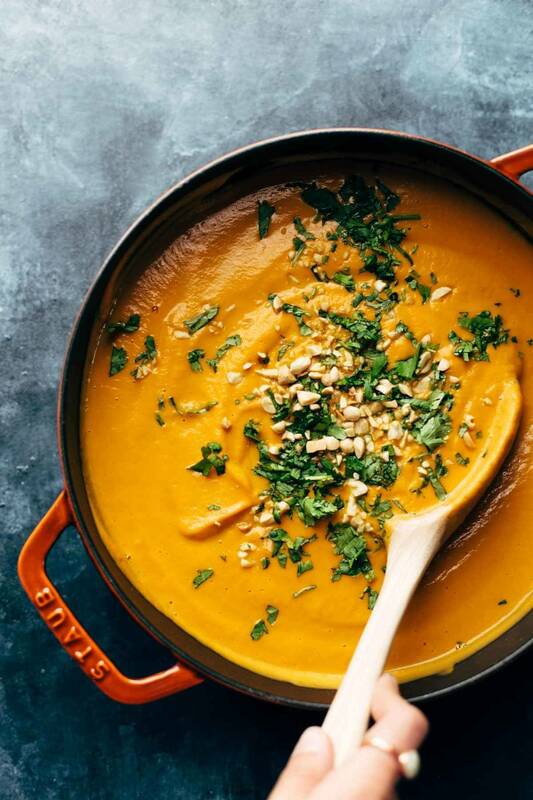 How can I make this carrot soup with as little effort as possible? said tired/lazy/sad Lindsay. Instant Pot! (affiliate link) obvi. Where all good things go to be made great. 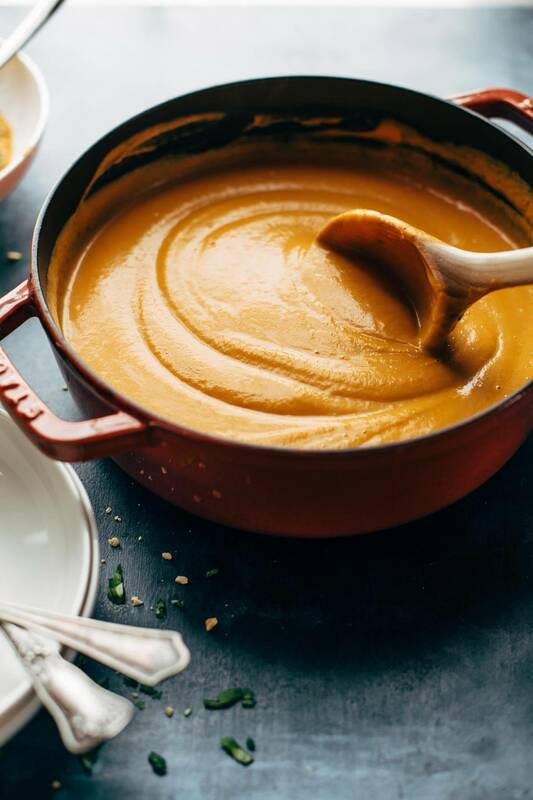 You don’t have to use an Instant Pot for this recipe – as you can see from that picture, it also looks lovely in a nice cast iron soup pot getting stirred around like the magically creamy vegan witch’s brew that it is. But the thing about the Instant Pot is that you can come up with your plan for lunch at 12pm and have your clean and fancy lunch on the table by 12:45, AND still somehow still manage to find the time to read that super important article on Bored Panda about a desperately thirsty cobra that is given a water bottle by a zookeeper and you won’t believe what happens next. That is just the reality of the carrot soup life when you enlist the help of the Instant Pot. This all feels like a repeat of a repeat, but THANK YOU for joining us in this series to honor the short and powerful life of our son Afton while bringing love to the people in your lives who are hurting. Thank you in a very big way. I love scrolling through your posts on Instagram and it’s been really fun to feature some of your stories of food love on my IG account aaaaand on our FABH page. If you want to dig a little bit, you can read more about Afton here, and you can check out the awesomeness that is generous food sharing on our FABH page right over heeeeere. We’ll be doing this series for one more week! And now you’re ready, right? Time to make bomb diggity carrot soup (which is VEGAN! CLEAN! VELVETY SMOOTH AND A LITTLE SPICY AND VERY AWESOME) by following this easy recipe. You are all over this. Curry-like spicy carrot soup made with 7 easy ingredients – in the Instant Pot if you want. Extremely smooth and velvety, and bonus: it’s super healthy. STOVETOP INSTRUCTIONS: Saute the onions and garlic with a little bit of oil until soft. Add the carrots, coconut milk, broth, and curry paste. Simmer until carrots are soft. Add peanut butter and stir until melted. Run through the blender until smooth; season generously with salt, top with peanuts and cilantro. INSTANT POT INSTRUCTIONS(affiliate link): Place all ingredients in the Instant Pot and set for 15 minutes. When done, let everything cool for a few minutes, then run the mixture through the blender until smooth; season generously with salt, top with peanuts and cilantro. Add more broth as needed to achieve the right silky-smooth consistency. lol Tonya! vegan carrot soup FTW. sounds delicious! 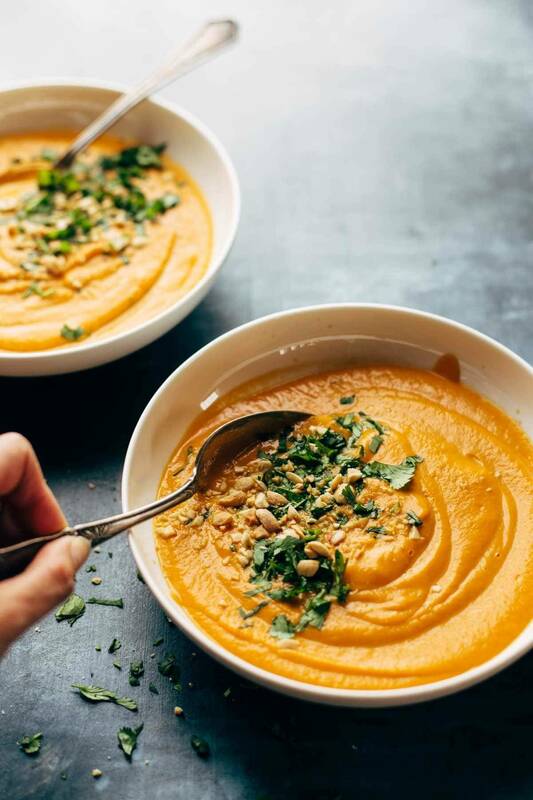 I make a version of this soup with butternut squash… using sesame oil to sauté the veggies and adding a squeeze of lime at the end adds a nice pop of flavor! yum! love that idea Heather! WOW. The texture of this soup looks amazing. It is literal soup heaven. I keep seeing Insta Pot recipes everywhere. I’m intrigued!!! Might be time to jump on the wagon 🙂 This sounds delicious!! doooo it! I have only just scratched the surface with mine. I love the instant pot recipes – I got one and am still navigating my way through it. When you say, set for 15 mins, did you just put on manual for 15 mins? Did you saute at all beforehand before setting the pressure? Also, did you just vent it right away or let the pressure go away on its own before opening? Thanks! I was wondering about the specific Instant Pot instructions too (I just got mine). Thanks! I agree, some detailed instructions for us instant pot newbies would be much appreciated! Thanks! I just made this today for lunch in the Instant Pot. I used almost 1 1/2 pounds of carrot, I did not saute anything first, I used manual for 15 minutes, I let the pressure come down naturally, and then I pureed it with my immersion blender. Deliciousness! Hugs to you Lindsay and Bjork. Glad you enjoyed it, Connie! This looks absolutely delicious! 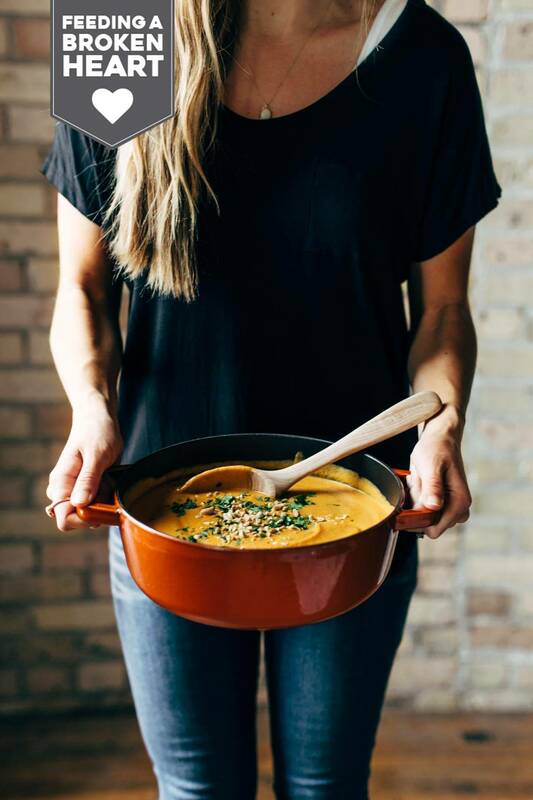 Not recipe related exactly, but any idea what size le creuset is shown in the pictures above? It’s actually a Staub and I am pretty sure it’s a 4quart. 🙂 and it’s adorable. We use usually use Lodge for cast iron, but I just have this one Staub and I love it too! Thanks Bita! hope you like it! A friend of mine recently had dental surgery and I made her a big pot of Carrot Soup for her days after recovery. I love the way that it’s so versatile–you can make it anyway you like (I like to load mine all up in Chinese Five Spice and yellow curry powder) but no matter what, it feels like a hug. This looks amazing, but do you have any suggestions for making this recipe less spicy? I really wish I liked spicy food, but my mouth is a wimp haha. You could omit the curry paste or just use less – more like 1 teaspoon. 🙂 Or try using cumin instead, something that gives it flavor without the heat. To be honest, as is, it is only mildly spicy – I think you could handle it! haha love that you reference the thirsty snake…as much as I don’t like snakes, I felt really bad for it! hah love that you referenced the thirsty snake, as much as I dont like snakes, I felt really bad for it! I don’t think I’ve ever thought carrot soup sounded so delicious! Only tried boxed carrot soup before and was not impressed however this soup is super easy and very tasty. Added 1 tbsp of minced ginger and 1 tbsp of honey. Soup is not very spicy but terrific flavour. Thank you for posting the recipe. Makes almost 2 liters of soup. Great to share. I’ve already made this recipe and it is wonderful! I delivered a large helping to a good friend across the street, and she now has the recipe and is going to make it as well. Thank you so much! I hope that you are doing well. I know what it is like. Lindsay, I saw the Bored Panda/Thirsty Cobra post, too! I remember wondering if anyone else I know saw it, because no one I know follows that, and guess what, someone i “know (finger pointing atcha) did! Ha!!! Love these food photos! what a pretty color of soup! I’ll have to try this recipe soon, thanks for sharing! This looks so comforting. I might try to make this as a vegan side for Thanksgiving. What kind of red curry paste do you use? Love how creamy this soup looks! Yum! Oh my goodness, I have made a super similar one from another site and it was to die for!!! It had sweet potatoes in with the carrots too. I’m a sweet potato fiend. But this whole insta-pot craze is throwing me for a loop. I need to get on board with that ASAP! I also do a carrot and sweet potato and apple version of this, with 1 tsp of cumin seeds, a 1″ piece of ginger (grated). This was the first time I had added coconut milk to it though. Very nice soup. Yum! I just made this for lunch on the stove top. I used cumin instead of curry paste because I didn’t have any and used almond butter instead of peanut butter. Topped it with some hemp hearts- YUM! Thanks for the recipe! Love carrot soup and this soup has a great combination of flavor for a perfect comforting warm soup.